If you want to send email campaigns to a group of receivers, especially when you have few different people from one company, create your list based on contacts in your CRM or add it manually. Done! your list has been created. You can see it by clicking on a cog icon in the top right corner and selecting Contact lists. If you mark your clients with tags, you can easily send them an email campaign. You can use this kind of list eg. when you want to inform all your clients with VIP tag, that they can test a new feature for free. The list is dynamic, which means that everytime you mark a client with a tag, the client will be automatically added to a list. Note! 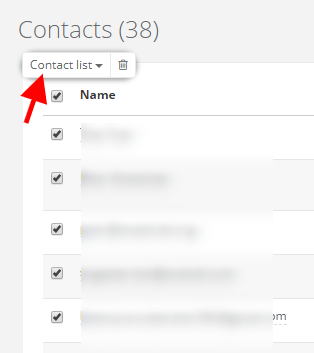 If you create a contact list based on tag, only main contact from client's profile will be added to a list. If you want to send your campaign to more people from one company, choose the first way of creating a list. 4. In additional field (displayed after selecting 'Tag' option) type in the name of chosen tag for the list. 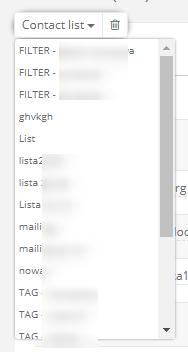 If you use CRM advanced search, each result you can save as a filter, and then create a mailing list based on this filter. Thanks to this feature, you can quickly send eg. invitation to a certain group of clients. Like with contact lists based on tags, this list is dynamic and also contains main client's email address. 4. 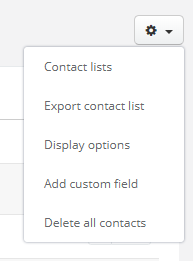 In the Client's filter field select the name of the filter to create a contact list.